What is Post Thrombotic Syndrome? 1 What is Post Thrombotic Syndrome? Post thrombotic syndrome is the worse condition of Deep vein thrombosis. 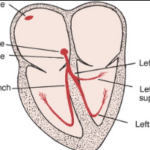 Anatomically, tiny valves are present in deep veins located at legs and assisting in controlling the blood flow direction. Any clot formation in a deep vein of the leg can cause swelling and obstruct blood circulation. The resultant of this leads to damage of the valves. The damaging of valves causes leakage and fluid accumulated around the ankle. Delay curing or not properly healed clot can also cause blood circulation obstruction in the leg. Pain, inflammation, redness in the leg gradually turns to ulcer formation in the affected leg at the advanced stage of post-thrombotic syndrome and that become difficult to treat1,2,3. Post Thrombotic Syndrome (PTS) symptoms arise on the legs and clinical presentation include chronic leg aching, inflammation, leg muscles become frequently fatigue, feeling of heaviness, skin patches in the legs due to hyperpigmentation, edema and subcutaneous fibrosis in the affected lower extremity. If the condition becomes severe then venous claudication and venous leg ulcers can progress. Both these conditions can significantly restrict movement of the affected individual and limit the working capability, which ultimately hampers the quality of life of the patients. Evidence also supported that the degree of reduced quality of life in chronic Post Thrombotic Syndrome can be comparable with other chronic ailments such as chronic obstructive pulmonary disease and arthritis4,5. The symptoms of Post Thrombotic Syndrome can be divided into two stages, initial stage, and advanced stage. In the initial stage, the symptoms are similar as Deep Vein Thrombosis. Prolonged standing or walking leads leg aching, pain and inflammation in a higher degree. Rest and lifting up of leg provide relieve from these symptoms. It is always advisable that if any symptom arises, then better to discuss with the doctor, who can diagnose the possibility of Post Thrombotic Syndrome development by symptomatic analysis3. Clot formation over the knee, clinically this condition is termed as proximal deep vein thrombosis. Blood-thinner medication unable to control blood thinner levels after continuing the medication for 3 months3. There is no special diagnosis testing for PTS. The primary diagnostic tool to diagnose the Post-Thrombotic Syndrome is anatomical and/or physiological findings. Detail medical history with symptomatic analysis and/or physical findings are primary investigative tools of post-thrombotic syndrome. All these findings are directing that duplex ultrasound requires performing for spotting iliac vein blockage and/or superficial valvular deficit in the great saphenous vein (GSV) and/or small saphenous vein (SSV). Ultrasound evaluation of the femoral vein and profunda femoral vein is conducted before performing stent placement5. Traditionally anticoagulant therapy is prescribed for DVT and the initial stage of PTS. But currently, anticoagulant therapy is not frequently prescribed as PTS is reoccurred frequently. 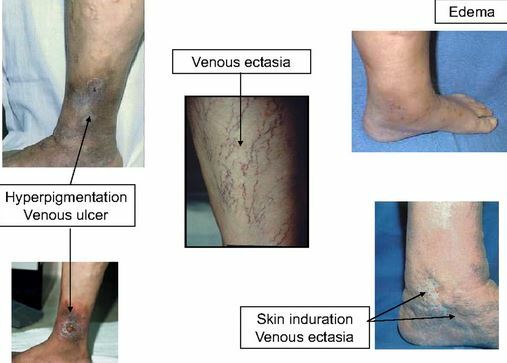 Patients with venous leg ulceration usually treat with nonselective phosphodiesterase inhibitor (pentoxifylline) and platelet aggregation inhibitors (rutosides). Alternatively, sulodexide can also prescribe in alteration with rutosides. To local wound care, sulodexide is administered intramuscularly at the beginning of therapy and then orally. Elastic compressive stockings can control mild to moderate symptoms of PTS and also reduce the risk of progression of PTS, but may not be effective to treat severe PTS related symptoms. Intermittent pneumatic compression (IPC) is a newer approach to compressive therapy to treat the PTS affected patients with elevated venous pressure. IPC can effective to control severe leg edema and/or venous leg ulcers. But IPC is expensive than other compressive therapies like wearing stockings and it also causes inconvenience, as the therapy requires to pump for more than a few hours in a day. Another novel compressive approach is battery-powered, boot-like compression device i.e. VenoWave. This device is lightweight and portable. The application of this device provides a good prognosis. Mild to moderately affected patients suffering from PTS may get benefits from exercise therapy. Different medical products are available to treat venous leg ulcers, such as topical antibiotics, exfoliants, ointments, compression wraps, and growth factors. Depending upon the patient condition and nature of symptoms doctor prescribe these products5. Ashrani AA, Heit JA. Incidence and cost burden of post-thrombotic syndrome. J Thromb Thrombolysis. 2009; 28: 465–476. Kahn SR. How I treat postthrombotic syndrome. Blood. 2009; 114: 4624–4631.